This was one of the quotes that resonated with me the most from Jillian Michaels Maximize Your Life tour here in Columbus this past Thursday night! As you all know, I was over the moon excited to attend this show and be lucky enough to have the chance to meet her afterwards. My personal favorite part of the two hour show was the health and nutrition portion. It reminds me of one of those things where you go in thinking, "I got this" or "I know what I'm talking about" just to realize you don't know it all and sometimes you need help. It's just true. Besides, Jillian is the expert and while I did know many of the things she talked about, I learned a lot and Billy's jaw was dropped half the show. Let's just say I was SO glad I brought him. Ladies, if you have a man in your life (boyfriend, husband, or even father) who might need some more education about what he's putting into his body (even if he doesn't have weight to lose, etc), her show would be great to take him to. I've always tried to educate Billy about the food he eats, especially the type of meat he buys, but sometimes it goes in one ear and out the other, ya know? But seeing it from a true professional (and Jillian at that) definitely opened his eyes. She touched on calorie counting, foods to avoid, foods to eat everyday, etc. We also enjoyed hearing Jillian's personal stories (she suffered with obesity as a teenager and had some family issues) and gave her own personal insight in what she does to succeed was awesome to hear. If you're struggling with your weight and can't seem to figure out where to turn or what to try next, I honestly think going to her show would be beneficial for you. At the end of her show, she spent a good 30 minutes doing a Q&A session with the crowd where you could share your personal goal or problem, and she would give her advice and opinion. It was amazing to hear her responses and suggestions! Overall, her show surpassed our expectations and I would definitely go see her again. She really put on a great show. Oh, last but not least, a really awesome thing happened and she called me her "twinsie" (we were wearing literally the same style jeans and booties) and she even made her photographer take a picture of our outfits. If only I would've done an #ootd together, right? ha! It's only logical for me to assume now that we are best friends and I will be traveling with her for the rest of the tour. I hope you all sense my sarcasm with this but Jillian, if you're reading, I'm totally available. You two look like bff's in that picture! :) Such a great experience! That is so awesome that you got to meet Jillian! I love her! Upon reading this I decided to see if she was coming to Houston and she is! April 3rd and I already bought tickets. Yup so incredibly pumped!!!! So neat!!! I would love to hear more about what she said regarding calorie counting and what foods to eat everyday. She's such an inspiration! And you are anything BUT a beast!! How amazing is this?! Love her....and a beast? Um no my dear...I have heard she is just a miniature little thing lol. That is so neat! What a great experience! She is definitely someone I'd like to chat with for a bit! I didn't know she had more to offer than weight loss...a great experience for you. I saw here in FL and it was one of the best things I could have done! She was so inspirational and I learned so much about food that I had never known! Wow! I would love to meet Jillian! After working SO incredibly hard and losing over 230lbs, getting pregnant and losing my son, gaining about 40lbs back and just trying to get back on the health bandwagon.. I just feel like she would be the greatest inspiration!!! I will say that I have been clean eating for a week now, fast walking two miles a day and feeling really proud of myself. Motivation is pretty hard to come by for me but I keep repeating a handful of mantras to myself and I hope that I can continue this journey!! That is so awesome! 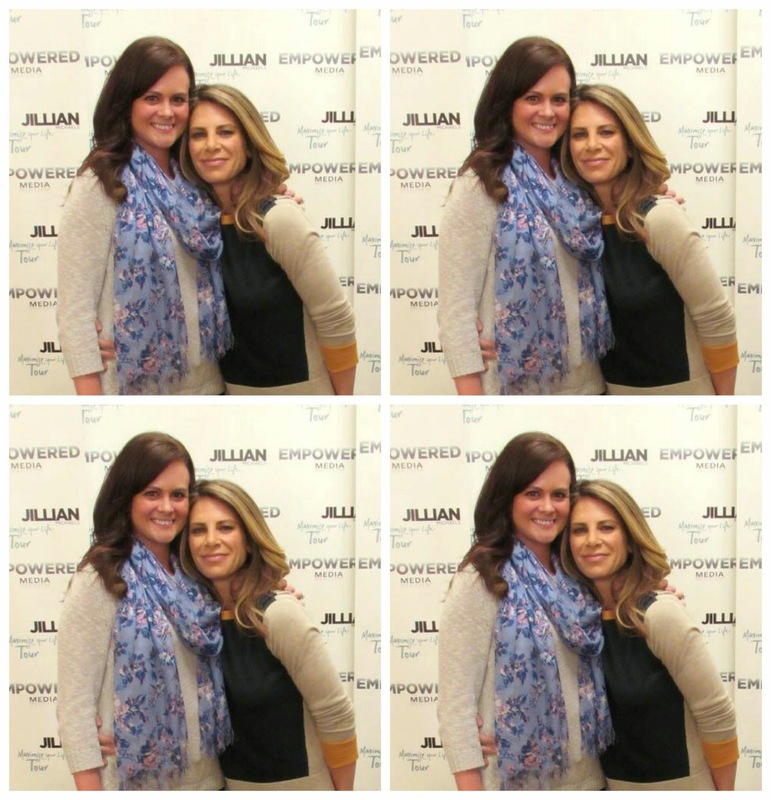 Although me meeting you would probably have the same excitement level as you meeting Jillian!